1. I started this project about 6 weeks ago. Here, was the first pic I took. This is hand built from coils. 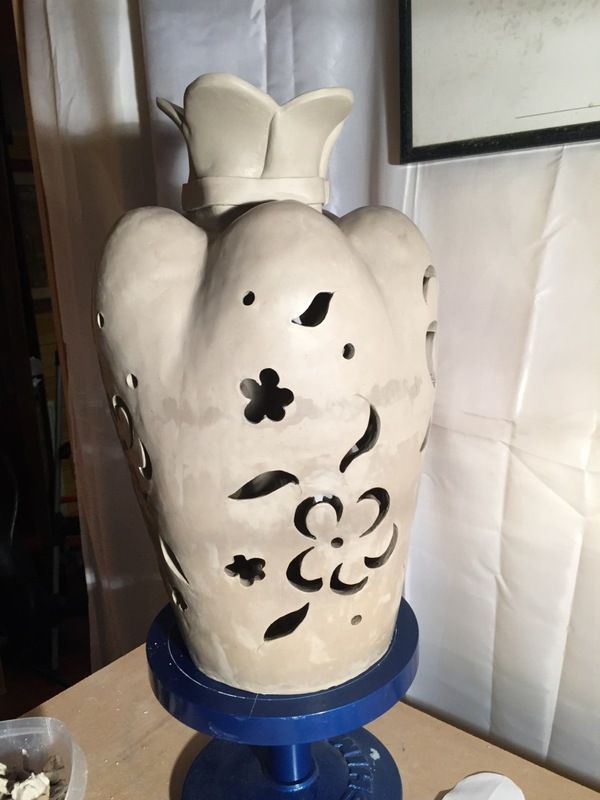 Coils are snake shaped pieces of clay wrapped around and around. I then smoothed the sides by meshing the coils into each other. 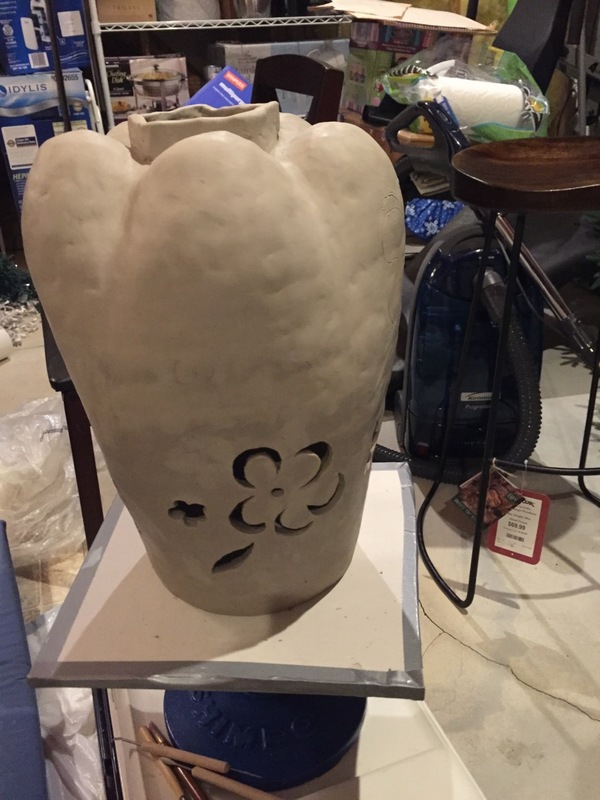 I should note that I started with a round flat base of clay for the bottom. 2. It became too tall for my work table, so I had to move it to a lower level. The blue banding wheel provides smooth spinning to be able to work all sides. 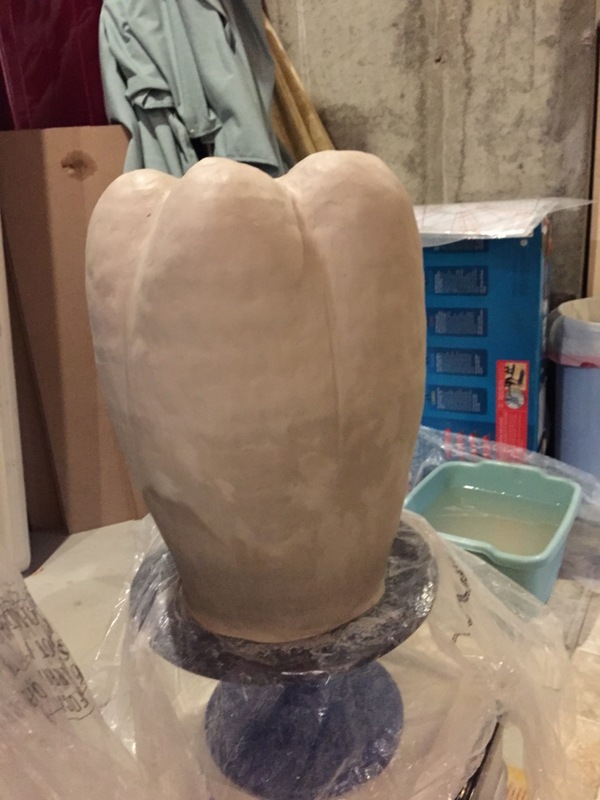 I used a tool I have that evenly spaced marks I made to begin to give this shape. 3. The most difficult part was adding these shoulders. Gravity was not working in my favor, but it worked out better than I imagined. 4. It took me a LONG time to determine the neck. I had fun cutting out shapes. 5. Finally got a top I liked. I actually cut it off once because it was too long and I rotated it as well. I have to keep it covered so it doesn't dry out before I finsh my cutouts. 6. 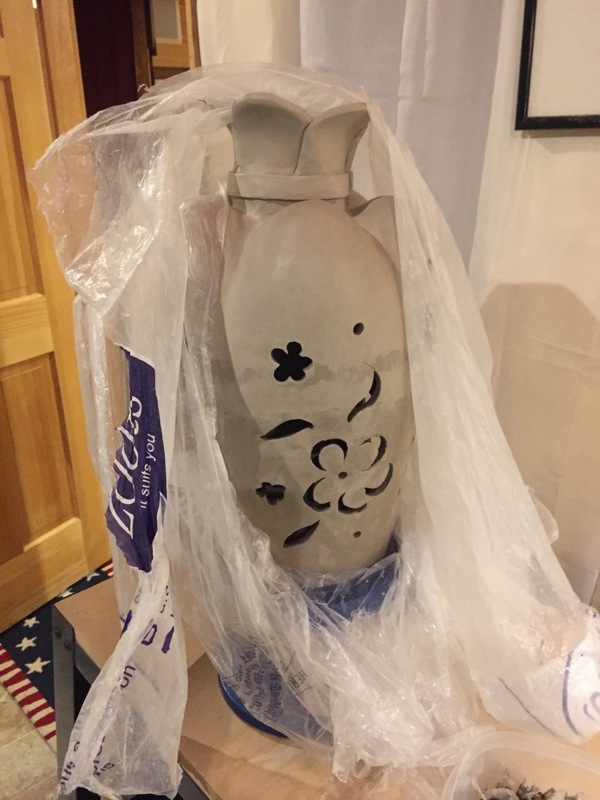 Once it's completely dry, it'll be ready for its first firing: the bisque. 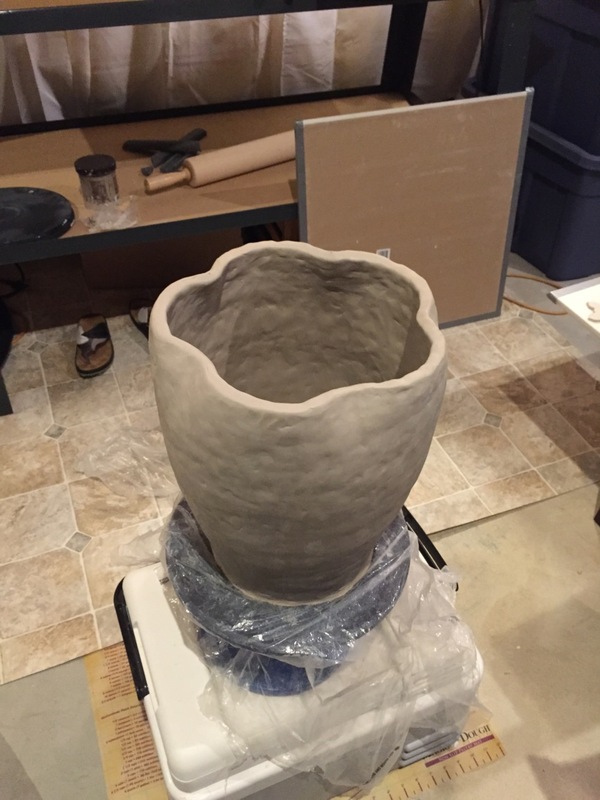 Bisque firing is done at a low temperature (cone 04 = equals 1971 degrees) and completely removes any leftover water. I'm waiting for this to be completed. 7. 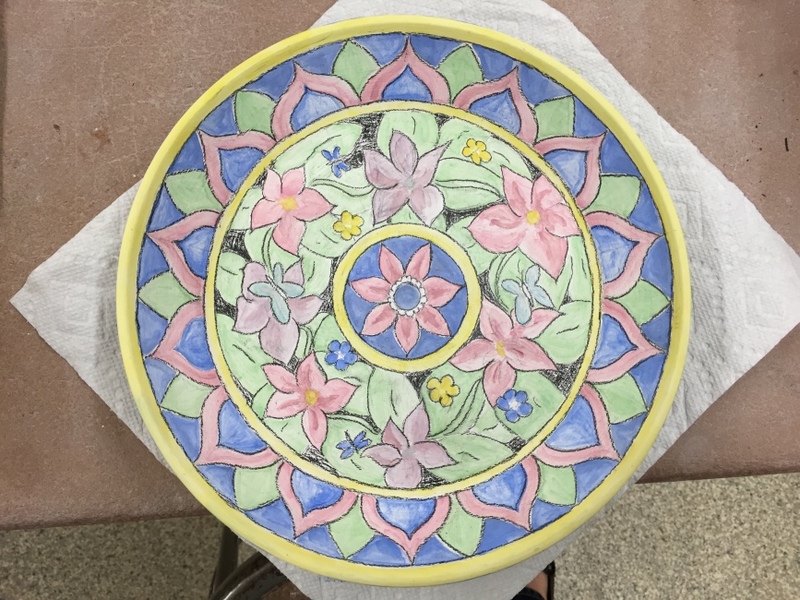 I had a plate I threw on the wheel about 2 years ago. I had been planning to paint a favorite seaside scene, but I'm not a painter, so I've been intimidated to begin. I finally found another purpose for it. I decided that while I am waiting for the big piece to be bisqued, I'd use this plate as a sort of test tile for what I plan to do with the larger piece. 8. The plate was then bisqued again, to affix the color more securely. 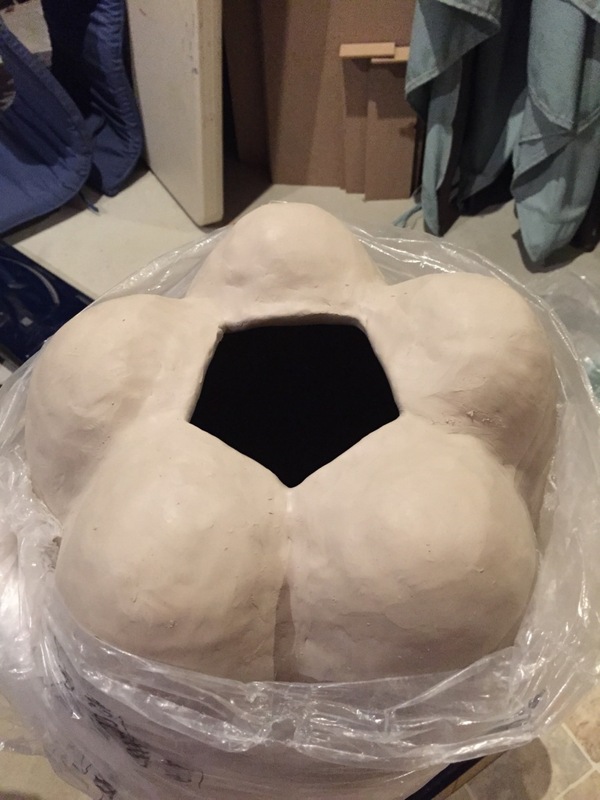 Because it's smaller and was already completely dry, it got in the kiln before the large piece. It came out of the bisque looking exactly as it does above. 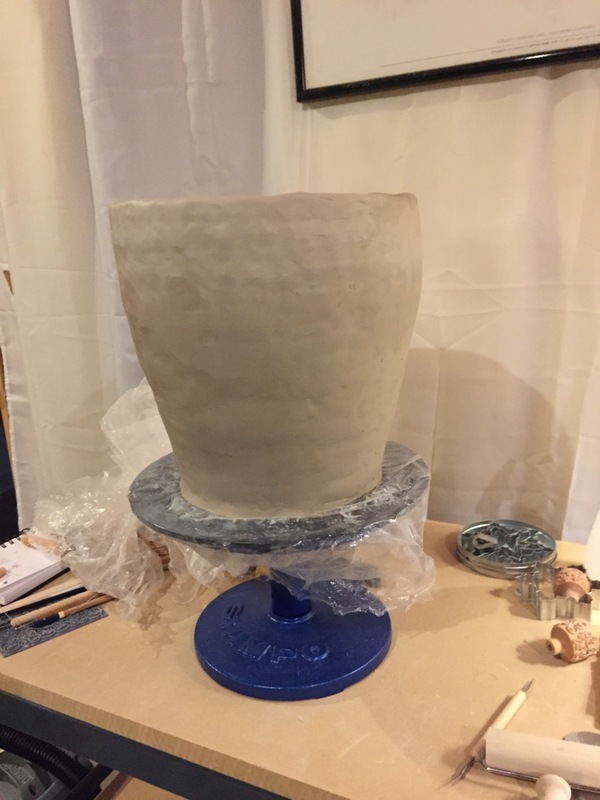 Just a couple of days ago, I glazed the plate with a clear glaze and it is currently waiting for the next cone 6 firing (=2269 degrees). At this temperature the colors of these underglazes will react. 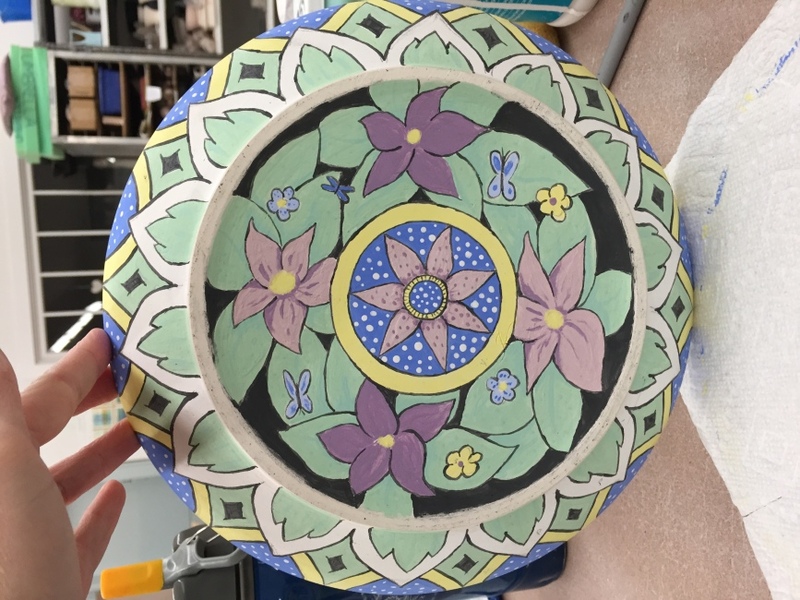 I expect the top of the plate (left pic), to fade to a more water-color look, while some of the colors on the bottom (right pic) might deepen - the blue for sure. The green will be what I'll be watching for most, as I have yet to be satisfied with a reliably pleasant green.